“The EAD10 is a huge breakthrough for acoustic drummers...Whether for recording, performing or practice, this module opens up a world of possibilities for creativity,” said Steven Fisher, marketing manager, Yamaha Drums. 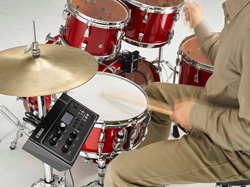 Yamaha today introduced the EAD10, the first-ever stand-alone acoustic drum module system enabling drummers to easily capture the sounds of an acoustic drum set with a single microphone/trigger component attached to a powerful digital processor. Ideal for recording, rehearsal and performance, the EAD10 addresses persistent challenges facing drummers who want to record high-quality drum performances easily and affordably, thanks to its central module and combination microphone/trigger sensor that easily mounts on the bass drum. The microphone effectively captures and reproduces the natural, dynamic sound of the entire kit, while the module adds any number of effects, including flange, phase, and several varieties of reverb. For hybrid drum expansion, the central module features a snare trigger input and two 3-zone trigger inputs that are compatible with the Yamaha DT50S snare trigger and DTX Series pads. This connectivity provides endless creative possibilities with nearly 800 stored sounds and effects, an onboard sampler and 50 preset combinations, with room to program 200 more. The EAD10’s free Rec ‘N’ Share iOS app enables drummers to record their drum track on top of their favorite music, while at the same time capture a video of their performance. Once complete, they can easily share the final result on social platforms such as YouTube. Bands performing in small live venues may want to connect the central module to a mixer, to use the EAD10 as a reference for the PA system. With all drums and effects routed through the PA, the EAD10 helps integrate a live band’s sound into a more coherent whole.